Cell phones, tabs and other gadgets nowadays are having so many applications which correspond to higher energy consumption that the battery charge cannot last long. Thanks to power banks; we can use our phones and gadgets in the whole day without the need of an AC power. Let us uncover how power bank works. Non-portable power banks are stationary. They are mostly with very high storage capacity, high power that is used a temporary backup power in households, offices and establishments. Portable power bank is the one that is can be carried by the user wherever he/she wanted to go. Famous example is the cellphone power bank that nowadays is very famous. This is the common method of charging you electronic gadgets when you are at home. You will plug the charger to the wall outlet and the charger output port to your gadget. When you are travelling, you cannot use above way of charging especially when you are mobile or simply there is no AC power available, charging through a power bank is the best option. A Power bank is simply energy storage like a battery. It has input and output ports. The input port serves as the connection to the charger while the output is where the devices use the power bank connect. In the case of a portable power bank, the input and output connectors are already USB compatible. Power bank stores energy when it is charged. This energy will serve as the power source to the device that uses the power bank. 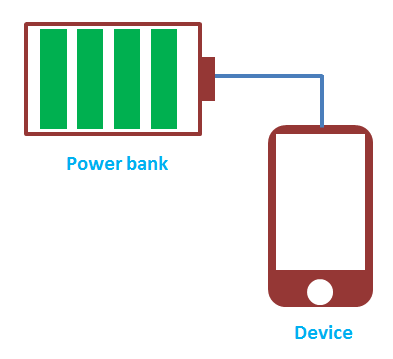 It is not difficult to understand how power bank works. 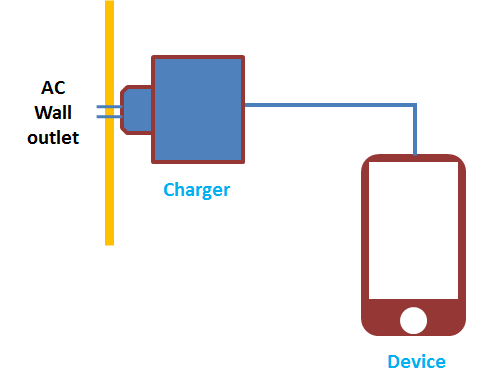 Further informations that may be relevant to you is the circuit block diagram of a power bank. A power bank has input port, charging circuit, battery, discharging circuit, output port and indicators. The input port is use to charge the power bank. 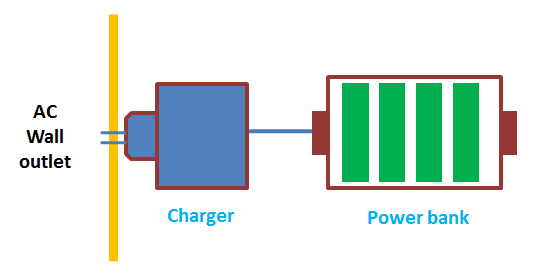 The charging circuit is designed to recharge the power bank from a charger. This regulates the voltage and current that will supply to the battery. The battery is the energy storage element. The discharging circuit is functioning almost the same to the charging circuit. It will control the current drawn from the battery. Too large discharge current will shorten the battery life. Output port is use to connect to the devices and gadgets that will charge from the power bank. Indicators are simply added features for visual monitoring. How many charge I can get from a power bank? How long a power bank charge last? 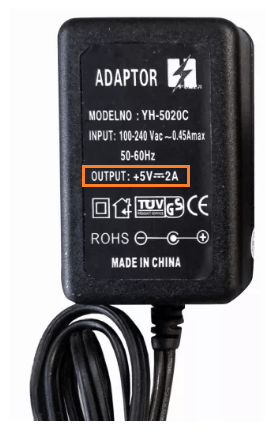 Look at your cell phone charger output current rating. See below as example. Supposing the current rating is 2A and we will assume that your phone will draw all this current. Supposing the usual charging time 2 hours, if you have a power bank with a 10 ampere-hour rating, you can fully recharge your phone twice. Below is a simple calculation. If you have identified your budget, look for best item on that budget range. Best item means the highest energy capacity, has safety features, and has passed standards and so on. Knowing your needs means you should set how many times you need to charge your phone or gadgets from the power bank in a day. Supposing your phone is drawing 1 ampere of current and get fully charge in 2 hours, it has 2 ampere-hour energy consumption. If you want to charge from the power bank at least 3 times a day, then you must consider buying a power bank with an ampere-hour rating of more than 6 A-hr or 6000 mA-hr. You must ensure that your phone or gadget terminal connections are compatible to the power bank ports. Power banks come in different sizes. Select the best for you. If you are looking for a high end and reliable power bank, then consider buying the one with a safety stickers and certificates like from UL or other safety bodies. Next Post:Smart Grid Technology: Why do we need it?